Series 1891 Treasury Notes are similar to series 1891 notes on the front. The backs of the series 1891 notes are drastically changed to a more simple design with larger blank fields. Oddly, it was considered harder to counterfeit the simpler design. I can't see how that would be true...sadly the series 1891 notes lost a lot of appeal with the change. If you have Series 1891 Treasury Note please contact me for values. The 1891 $1.00 Treasury note is the most commonly available Treasury Note in the series. The note is worth from $75 in rag condition to $3000 for a perfect example. If you have an 1891 $1.00 Treasury Note please contact me for values and information. Stanton was Lincolns secretary of war and was an interesting character. The 1891 $2.00 Treasury note is much less common than the $1.00 in the series and can be a little pricey in high grades. A decent example can be found for several hundred. A range of values would be from $200 to $4000. General James McPherson (Union army) the second highest ranking Union officer to die in the war and the only Union Army Commander to die in the field. If you have an 1891 $2.00 Treasury Note please contact me for values and information. This grim faced character was a civil war general who was known as the Rock of Chickamauga or the Sledge of Nashville. The 1891 $5.00 Treasury note is rare in high grade, rarer than the 1890 series note. A ragged example can be found for a few hundred while an uncirculated note could reach 8,000. If you have an 1891 $5.00 Treasury Note please contact me for values and information. The 1891 $10.00 Treasury note is a pretty rare note especially in great condition. This note features another Civil War General, General William Sheridan who is shown in uniform. He reach the grand height of 5ft. 5 inches and was known by the nickname "Little Phil". Lincoln reportedly remarked of Sheridan, "A brown chunkly little chap, with a long body, short legs, not enough neck to hang him, and such long arms that if his ankles itch he can scratch them without stooping". Funny Lincoln would mention that since it likely applied to himself. This note is a valuable note which can run from $600 to over $10000 in the highest grades. If you have an 1891 $10.00 Treasury Note please contact me for values and information. The 1891 $20.00 Treasury Note is a rare note as there are fewer than 200 known in all grades. These notes are sometimes called Marshalls after John Marshall, the pictured swell. He was the fourth Chief Justice of the supreme court. The 1891 $20.00 Treasury Note can run the range of values from $500 to $40000 in the highest grades. If you have an 1891 $20.00 Treasury Note please contact me for values and information. The 1891 $50.00 Treasury Note is unique in that it wasn't issued in a series 1890 design. The note features William Seward, best known for organizing the purchase of the Alaska territory. There are just over 20 known examples of this note known so it's very rare. The 1891 $50.00 Treasury Note can run the range of values from $500 to $40000 in the highest grades. If you have an 1891 $50.00 Treasury Note please contact me for values and information. The 1891 $100.00 Treasury Note is a rare note with fewer than 65 known to exist. 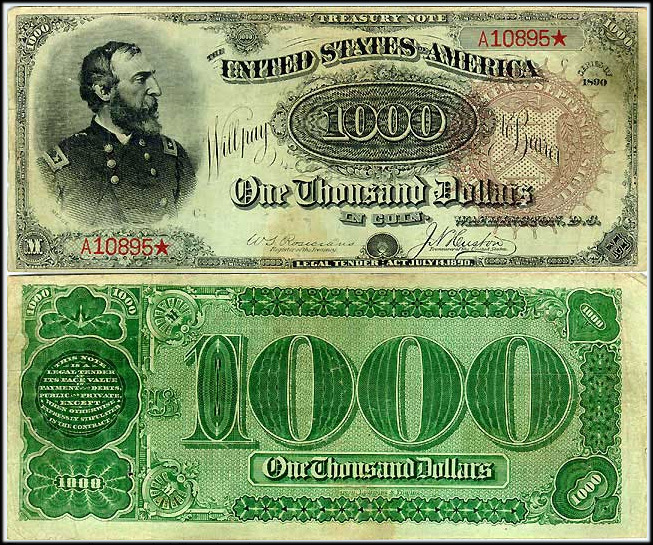 A range of values for an 1891 $100.00 Treasury Note is from $15000 to $100000. This note features Admiral David Farragut who was known to have said "Damn the Torpedoes, full speed ahead". If you have an 1891 $100.00 Treasury Note please contact me for values and information. The note shown is the 1890 version. I couldn't find an example of the 1891 note. The 1891 $1000.00 Treasury Note , is still a wonderful note but it's not a watermelon. There are only four known to exist and one is in the Smithsonian institution. The note in private hands was rumored to have sold for 2 million dollars. If you have an 1891 $1000.00 Treasury Note please contact me! This note features General George Meade who commanded the Army of the Potomac in the Civil war.